BONEHEADED Forget the dogs. Save those bones for yourself and make a nourishing meal in a bowl. Not only is bone soup good for you, but learning how to make the stock will take your cooking to new levels. Bones contain a diverse cocktail of nutrients that become available as they cook. After a few hours of heat, the tendon, cartilage and other pieces of connective tissue begin to melt into collagen, gelatin and other base proteins that are hard to get from non-animal sources. Just ask any vegetarian Jello lover. Those melted connective tissues are good for our own connective tissues, helping them rebuild after a tough session, which is one reason bone soup is considered a great recovery drink for athletes. 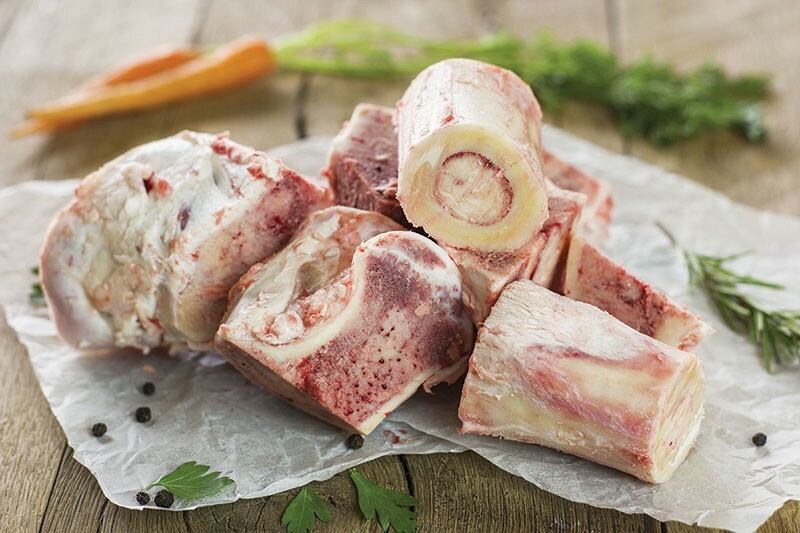 Many prefer to cook their bones even longer, in order to extract minerals like calcium. A common practice is to add a tablespoon of vinegar to the bones to enhance mineral leaching. In order to get rid of some fat (and perhaps save it for other uses later), the first step is to roast the bones in the oven. This not only melts a lot of fat, but also adds browned favor. I'll sprinkle them with salt and garlic powder and bake at 350 degrees, turning when necessary until the pieces develop a nice dry brown all around. When fat has melted off and everything is brown, allow to cool. Then transfer the bones to your cooking pot. Whole birds can be cooked into a broth in much the same way. Bake at 300 degrees until fully cooked; after it cools, fish the bones out of the meat and skin and proceed with the extracted bones, reserving the meat for later. Or do the same with a rotisserie chicken, and proceed. Next, simmer the bones on the stovetop for about six hours on low to medium heat. Strain the bones and let the stock cool slowly to room temperature, then put it in the fridge. (I prefer to use the Instant Pot, a multifunction electric cooker that has all kinds of functions. I pressure-cook the bones for 60 minutes of high pressure, and let the unit cool until the pressure drops and the lid will open.) After it cools completely, the solid fat can easily be removed. When making a soup of chicken, duck or beef bones, I will leave an amount of fat that I think will taste good with what I'll be serving. When in doubt, take it out; you can always add the fat back later when the soup is cooking. If I'm making stock to freeze, I'll skim all the fat out. To make a general stock or broth, add aromatic veggies like carrots, celery and onion, and cook at a gentle simmer for an hour or two. You can dress it up at serving time. Start with salt or soy sauce. If it needs fat, and you don't have any skimmed fat reserved from earlier, use a good olive oil. Hot sauces can be added, along with cilantro, parsley, sliced peppers, raw onions and lemongrass, grated ginger and garlic, and a dusting of black pepper. Dress it up in different ways, adding noodles or sopping it up with bread. You have all winter, and the rest of your life, to perfect your bone soup. Once you get the hang of it, all the research becomes quite edible.